DSCI (Data Security Council of India), a NASSCOM® body, has been setup as an independent Self-Regulatory organization to promote data protection, develop security and privacy best practices & standards and encourage the Indian industries to implement the same. We will discuss the DSCI Security Framework (DSF from here onwards) for now (discussion on Privacy Framework will come in subsequent articles) and its relevance for ISO 27001 implementers. 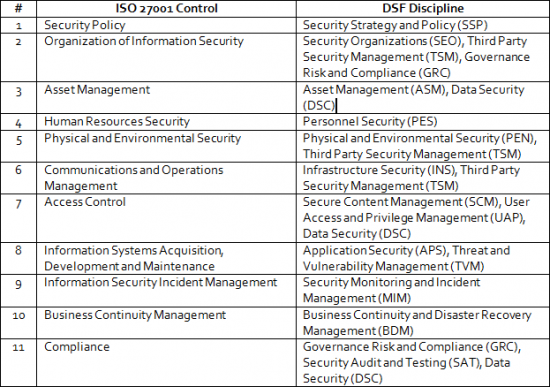 The DSF have been developed in the form of 16 disciplines across 4 layers each that need to be implemented / established in order to help organizations implement information security. The discipline centric approach helps in aligning an organization’s thought process to the market and helps in putting up a maturity based approach for both implementation and assessments. The layered approach helps in implementation and in client assurance; in light of the recent regulations, security and privacy implementations have been implemented in many organizations across the country, both towards due diligence and to provide appropriate assurance to clients regarding the security and privacy of their data. Awareness on the eco-system needs to be strengthened (expect more traction in coming days as the system is new). The opinions and viewpoints expressed here are personal. Sripati is an information security process consultant & software developer with an overall experience of 8+ years, doing ISO 27001 & HIPA compliant ISMS Implementation, Risk Assessment and Management. He is aself-driven professional who continuously keeps himself abreast of the latest happenings & regulations by being part of & participating in various information security forums. Check out his site (www.sripati.info) to know more.